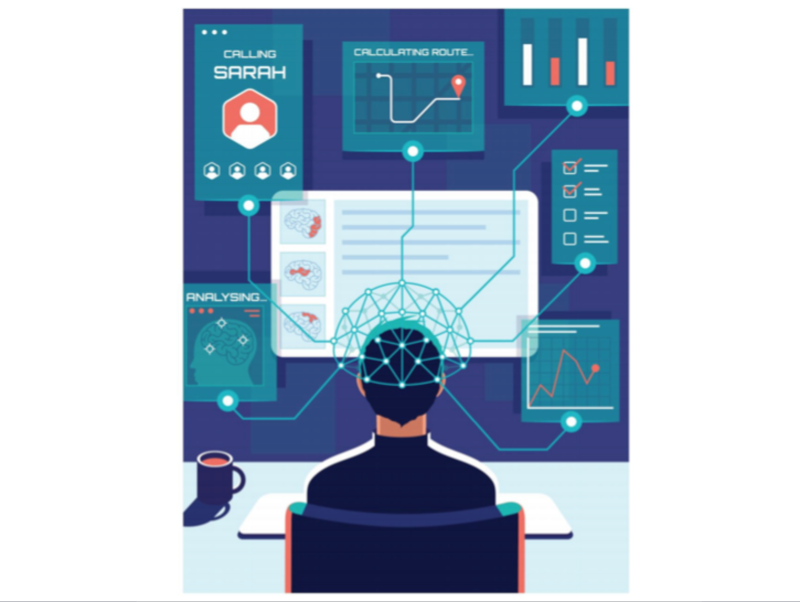 Just as innovations in modern healthcare eliminated outmoded medical practices like bloodletting, artificial intelligence will help to create a new future for human technology, work and life. In 1831, the U.K.’s Manchester Royal Infirmary used tens of thousands of leeches to treat ill patients in the heart of one of the world’s first great industrial cities. Only two decades later, Dr. John Leonard Riddell of Tulane University devised the first easily usable binocular microscope. By 1930, leeches had become all but obsolete, and the Infirmary permanently shut down its leech aquarium. It’s often said that the future is here, it’s just unevenly distributed. That uneven distribution of progress can also be seen in historical records. The bottom fell out of the leech market when Hirudo medicinalis – long the go-to solution for barbers and surgeons – was superseded by Riddell’s technology that allowed doctors to see, at a cellular level, what was truly causing the problem. A microscope could detect the bacteria that was causing tuberculosis; an intestinal infection that would lead to cholera; a cell mutating into a cancer. The medical microscope created possibilities that not only made the leech redundant, but created an industry that today employs millions of people around the world. In the process, the technological advance made the world a better place. This simple analogy is an entry point to understanding how AI-related technologies are set to change the world, again – to employ billions of people, and, in the process, make the world an even better place. For AI isn’t, as it is being popularly portrayed in the click-bait media, a job destroyer. AI is a new tool – a datascope perhaps – that will allow us to see in much more fine-grain detail, and allow us to do work that has previously been unimaginable. New tools allow us to do new things. Incredibly powerful tools allow us to do incredibly powerful new things. New tools don’t automate people away. They allow people to do things that people have never been able to do before. AI is set to revolutionize just about everything we can think of, in the way that technologies like the microscope changed medicine. In another generation, using non-AI infused technology will seem as barbaric as using leeches does today. It’s likely that the next generation of ambulance-chasing lawyers will argue that doctors who don’t use AI tools are guilty of medical malpractice. In the transformation from leeches to microscopes, did Riddell destroy anyone’s job? Well, probably he did. The leech magnates of Manchester no doubt went to their graves cursing his name. But microscopes were central to the explosive growth of healthcare that led to the population and economic growth that made the modern world. Nobody in their right mind now would argue that we should have stayed in a leech-based paradigm. Of course, if your current business model is a modern version of leech-breeding or leech-retailing, then AI is bad news. You may be able to eke out a living for a generation or two, as the leech magnates did until 1930. But nobody mourned the demise of their business – and nobody will mourn the passing of their modern equivalents. The medical field, in fact, presents lots of opportunities to see how the interplay between tools and people – between man and machine – plays out, and will play out, in the future. And nobody is closer to this – and more bullish on the possibilities ahead – than Dr Eric Topol, author of bestseller The Patient Will See You Now and founder and director of the Scripps Translational Science Institute in La Jolla, California. Topol has recently taken the ‘AI is a job destroyer’ argument head-on in radiology, where advances in machine-based MRI analysis have led some to believe that radiologists will soon be as redundant as leech wranglers. “AI is an adjunct to radiologists … whose purpose is to scale the productivity of radiologists … AI’s true impact on radiologists will be its ability to integrate information, rather than hasten information extraction … the amount and sources of information are outstripping our ability to understand their significance … AI is well placed to perform pixel biopsies,” he wrote in Journal of the American College of Radiology, March 2018. Topol sees AI not as a tool that reduces the labour component of a process, but as a way to increase the overall scale of the process. In short, the tool will allow the radiologist to see and do more, to manage much finer-grain information and, in sum, produce better outcomes. This is a profound insight and outlines a much more realistic vision of how AI will create the future of work, not just in medicine, but in every field. The three key ingredients of this future are density, complexity and speed. The first microscopes had a scale of 9X (i.e. they could make things appear nine times larger than they were). The most advanced microscope in use today (at McMaster University in Ontario, Canada) has a scale of 14mX (i.e. it can make things appear 14 million times larger than they are). This extraordinary magnification is opening new vistas in areas such as nanotechnology, which will be core to the next generation of electronics and technology. Greater and greater levels of density can be seen in just about any aspect of contemporary life, but ironically, are often hard to see. Take, for example, an ordinary Monday morning for an ordinary office worker in an ordinary town in any country in the western world. This density would be completely unrecognizable to Riddell. Put him in a time machine and catapult him forward to 2018 and he would be catatonic amid the bustle of the world he found himself in. (Tim Urban of acclaimed blog Wait But Why talks about ‘Die Progress Units’ to illustrate this idea – the amount of time it takes human beings to achieve enough progress that the shock of bringing a time traveller to your era would kill them). Even somebody retired for a few years and adrift from contemporary work mores would be shocked by this density of information, activity and action. Yet this is completely normal to most of us now. Allied to density is the complexity of life and work in 2018. Again, take an average worker in an average job and think about how many information sources they are trying to juggle, how many steps there are in the process they are executing, how many stakeholders need to be consulted, how many reports need to be generated, how many accounts need to be reconciled. Now think about a superstar hedge-fund manager, a video game developer, a commercial jet pilot, a CGI film maker, a reinsurance portfolio executive, a national security analyst. The complexity of these jobs – the information that needs to be sourced, managed, integrated, analysed, leveraged – is a far cry from the jobs that Richard Scarry would have outlined in his What Do People Do All Day? children’s book from just a generation ago. My job – as I’m sure is true for most Dialogue readers – is far more complicated than it was just a few years ago. I work with teams of people all around the world – we schedule meetings (for mutually inconvenient times) – with different cultural attitudes and expectations. I need to juggle much more information than ever, and need to be au fait with developments far beyond the walls of head office, let alone my home office. My clients – as are yours – are more demanding and unforgiving than ever. The stakes are higher. Bad decisions have greater ramifications. Disruption is a greater and greater reality. Life – and work – has never been less simple. Hence why, as an aside, so many people from Marseilles, to the aforementioned Manchester, to Mason, Ohio, have a deep nostalgia for the past: for less complicated times. In the 1990s, the chief executive of the software company Oracle, Larry Ellison, had an infamous dictum – the 24-hour rule – that made it clear that if you didn’t respond to an email within 24 hours you’d be out of a job. In 2018, that seems quaint. Twenty-four hours? If you don’t reply to an email within 24 minutes nowadays you’re considered a loser – a B-player in an organization that only hires A-players. Topol’s insight of how AI will allow radiologists to see more data (the pixel biopsy), integrate that with other information sources (‘multilayered data’, in his medical vernacular), and make faster decisions, is 100% transferable into any and every discipline and business process one can imagine. Density, complexity and speed are all set to be turbocharged by new AI and machine-learning capabilities. ‘Datascopes’ will allow your business to see more data, integrate it with other data, and make decisions faster than ever. And, in doing that, open incredible new opportunities for commercial growth and levels of employment. In What To Do When Machines Do Everything, a recent book I co-authored with Malcolm Frank and Paul Roehrig, we argue – counterintuitively to some – that in ten years, employment levels in the Western world will be higher than they are today. For some people that’s a head-scratcher. But in our vision, as in Topol’s, AI is the next generation of tool that – as tools have always done – allow people to do things faster, easier and more proficiently than they could without tools. AI and automation will only have a net negative effect on jobs if – and this is a huge ‘if’ – we can’t find new things to do. Dr Riddell’s microscope allowed people a panoply of new things to do – thank heavens. Our new tools – in medicine and every other industry – will allow us to grapple with a world that is denser, more complex, and faster than ever before. From that algorithm (Dn x Cn x Sn) emerges the future of all our work. Leeches need not apply.